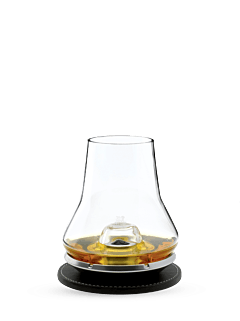 Created to enhance whiskies, the Peugeot whisky glass is designed to release the aromas in the centre of the glass so that they concentrate and rise. Whisky is the spirit with the widest range of aromas and nuances. This is why a whisky tasting is a matter of sensory analysis. Connoisseurs talk about the 'eye' to describe the colour, 'nose' when inhaling the scents and the bouquet, 'mouth' for the taste, and 'finish' for the indescribable taste that remains in the mouth after tasting. That's why Peugeot has created a collection where each of our stylish whisky glasses is a pleasure to hold, swirl and contemplate, enhancing the spirit within while asserting itself as a truly exceptional object. Derived from the unique savoir-faire of Peugeot’s master glassmakers, these original whisky glasses combine quality of execution and beauty of design to perfectly fulfil the two essential functions of the glass: give the whisky all the space necessary for the release of the aromas with a wide diameter and generous curves, and concentrate them in a narrow opening, for the enjoyment of complexity and subtlety.